A very rare, fully restored gentleman’s 9ct vintage Rolex Precision dress watch, complete with its original Rolex integral bracelet, from 1960. Such examples are now becoming almost impossible to find, especially in the outstanding condition you see here. This original Silver-White dial is one of the most simple and elegant Rolex dial designs, which has rightly earned the title of a ‘contemporary classic’. The dial is unusual in having very thin arrowhead and teardrop hour indices which are much prettier than the more usual ‘batons’. These are complemented by the original ‘Leaf’ hands. All in top original condition. This is the original dial which remains unrestored, due to its outstanding original condition. The watch carries its original high grade Rolex Calibre 1215 Precision movement, which as can be seen is in spectacularly clean condition. The movement has been completely disassembled, cleaned, inspected and rebuilt using only original Rolex parts, where required, by our vintage Rolex specialist watchmaker. His work is superb and when final tested, the watch was calibrated and running consistently to within 8 seconds per day, which is exceptional for any vintage watch of this age. The movement is all correctly signed ‘MONTRES ROLEX SA GENEVA’, ‘SWISS’, and ‘17 JEWELS’ with the Calibre number 1215 and the reference number 11017. These movements are strong, accurate and very reliable, making the watch perfectly suited for regular everyday use should you wish. This particular movement is in A1 condition and with regular servicing every 3 or 4 years, we would fully expect this watch to run happily for many more generations to come! We are therefore more than pleased to offer 12 months warranty on this watch movement*. The original watch case is of particularly high quality, having been made for Rolex by David Shackman & Sons of Chesham, Bucks, UK. Shackman & Sons were very high quality case-makers and one of two English case-makers used by Rolex, the other being Dennison & Co. of Birmingham. The case is of three-piece construction with a press-fit case-back which fits and clicks back with a reassuring click. This watch has been beautifully well cared for and has simply required a careful inspection and gentle hand-polish to bring it back to its current almost new condition. The outside of the case-back is unmarked and polished and has never been engraved. The case measures 34mm in diameter, not including the original crown and so this is a large sized Rolex Precision by the standards of the day. Please note, this watch did not have a signed crown when new. Inside the case-back, the markings are all correct for a Rolex watch case made by Shackman and signed D.S.&S (David Shackman & Sons Ltd) along with the reference number 11833. The case-back also carries London 9ct hallmarks which date this watch to 1960. Please note, our standard advice applies: Vintage watches should be kept clean and dry at all times. Very few Rolex Precision dress watches were made with matching Rolex bracelets and even fewer survive today. And to find an example in the condition you see here is almost unheard of. The size of this bracelet remains at its original full length, meaning this watch will fit an average gentleman’s sized wrist of between 18.5 and 19.5cm circumference, or seven and a quarter inches to seven and a half inches. The bracelet catch is adjustable for three positions and is shown in the photographs adjusted to its largest size. Please note if you have a smaller sized wrist, the bracelet can be tailored to your size at no extra cost. Although there are no original papers with this watch, the reference numbers, markings and signatures are all correct, dating the watch to 1960. A detailed ‘Particulars’ document will be included in the sale, along with our detailed receipt and our 12 months’ Warranty*. A separate insurance valuation for the replacement value of this watch will also be provided at the time of sale along with our unique ‘Lifetime Authenticity Guarantee’ which states: “If this watch proves to be anything less than totally authentic, or not as described, Vintage Gold Watches of London will offer you a full refund at any time”. The original Rolex presentation box, as shown in the photographs is included in the sale. This is a truly first class example of a 1960 vintage Rolex Precision dress watch which is ready to wear for evening or daytime use, as you prefer. 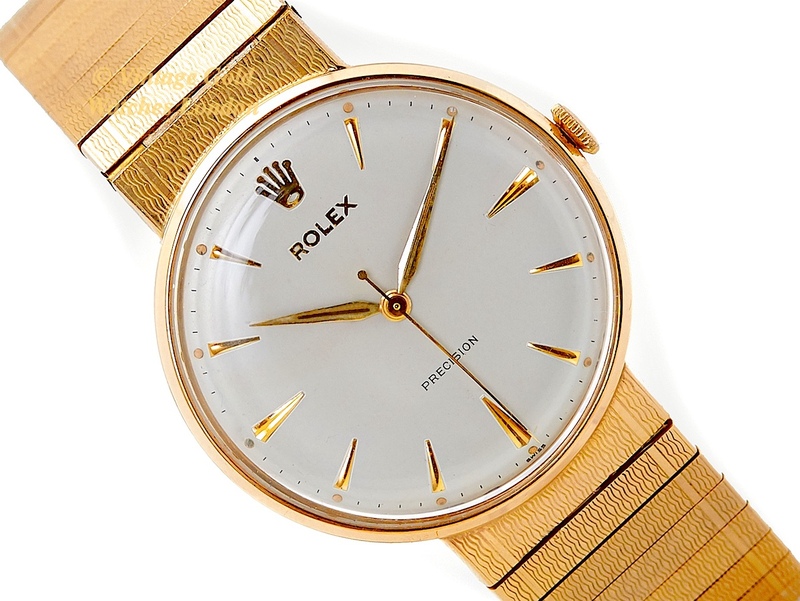 If treated with care, it will make an excellent investment or heirloom piece and even though vintage gold Rolex prices have risen markedly recently, we still feel good examples such as this are still undervalued and as each year goes by and the world market for vintage gold Rolex watches continues to expand, prices will continue to climb ever higher. This is a highly collectable vintage gold watch from horology’s most famous name which will provide an excellent financial investment as well as something to treasure and enjoy! A word on our prices – We always try our hardest to acquire the very highest quality watches we can find, before then restoring them to the highest possible standards. We then offer these at the fairest prices we can, taking into account our pre and post sales care and service. This approach means we will never be the cheapest, but nor will we be the most expensive. Indeed there are some well-known stores in West London which are highly successful charging between two to three times the price you see here. We therefore consider our prices to be fair, given the quality of watches we have to offer. We are happy to accept PayPal as this is the quickest method of payment. However, if you would like to pay by UK cheque or by bank transfer we will be pleased to assist you with this and pass on a 3% saving to you. Similarly, if you wish to pay by International SWIFT or Bank Wire Transfer we will provide you with our BIC / Swift number and our IBAN number. If you have any questions please call on Landline 0207 727 7095 or Mobile 07515 949250 or if calling from overseas on Landline +44 207 727 7095 or Mobile +44 7515 949250. Please note, we welcome part exchanges. If you have a watch or small collection for sale, please contact us as we will be happy to discuss this. Please take a look at our other vintage gold watches.